Set consists of 1 bottle 700ml Bioitalia Organic Tomato Paste Passata, 2 packets of 500g Bioitalia Organic Macaroni Small and 2 packets of 500g Spaghetti. Bioitalia pastas, sources high quality semolina that is the finest organic wheat from Southern Italy. Bioitalia Organic Tomato Paste Passata is made from the best selection of organic tomatoes Southern Italy. Organic tomatoes have unique and intense flavours that are rich in minerals and vitamins. Contains more antioxidants that curb free radicals and favour the well-being of our body. 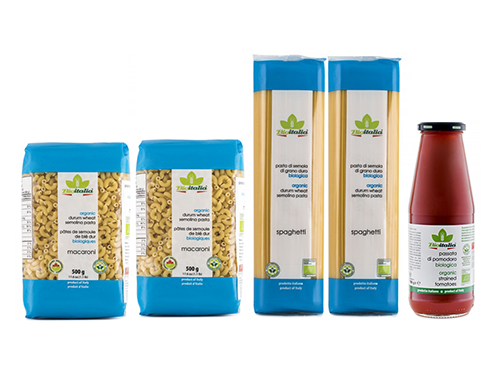 Macaroni and spaghetti is vegan and free from egg, dairy, GMO, peanut, tree nut and preservatives. Macaroni and spaghetti has ideal firmness and does not overcook.